I decided after I gained weight the last couple of weeks that I would start posting about what I eat and do a What I Ate Wednesday (WIAW) post every week. 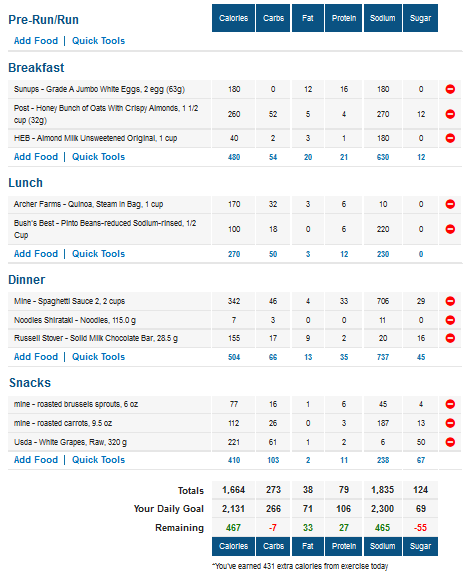 I’ll screen shot my daily entries into my MyFitnessPal food journal and will discuss how each day was for me. So, normally this post will cover from the previous Wednesday thru the Tuesday that is the day before the post. However, this week will only cover from Sunday thru yesterday. • Sunday: I ran 10 miles this day, so I earned myself some extra calories that I could eat. Since I just came off a week where I caved in on my cravings and urges to eat junk and binge on junk, so I was still wanting some junk. So, I ate a Totino’s pizza and one of those little lemon pies for my post-run meal. I ate healthy the rest of the day. 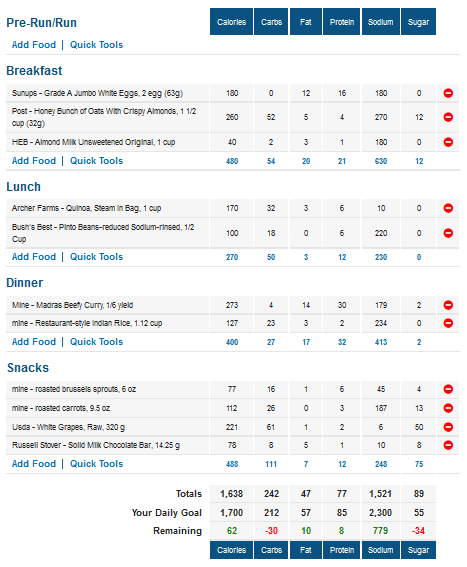 And I controlled myself with only eating ¼ of a chocolate bar with dinner. • Monday: first day on the “new plan” of eating. I ate my double serving of my cereal with almond milk and 2 scrambled eggs with some sea salt. I have nixed the bacon from my breakfast. Then I got to work and was in a position where I stand up most of the day and am also busy most of the day. I usually drink this giant mug of coffee when I get to work with 1 sweet’n’low and some powdered creamer in it. I wasn’t hungry at all for the majority of the day. I did start to snack on my grapes around 6pm in an attempt to get rid of the jitters that drinking that coffee had given me since chugging over a liter of water didn’t get rid of them. I took my roasted brussels sprouts and carrots, grapes and some mini sweet peppers for snacks (however I didn’t eat the peppers). For lunch I took some quinoa with pinto beans, seasoned with some Mrs. Dash original, cumin and fresh ground peppercorns. I know I’m still emotionally dependent on food, which is why I’m snacking so much. 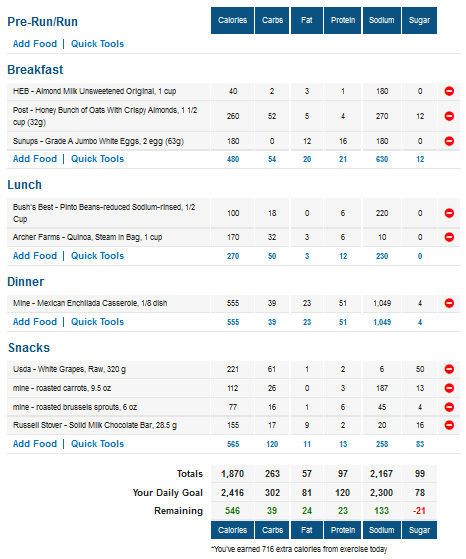 I’m working up to eliminating most of the snacking from my daily food routine. • Tuesday: day 2 of the new eating plan. All is still well. I ran, so I had “extra” eatable calories. However, I didn’t eat anything extra because I just plain wasn’t hungry. I ate my quinoa and beans for lunch and then chugged a bunch of water and then felt like I had overeaten. So I never ate my mini sweet peppers…again. • Wednesday: on to day 3 and we’re still doing great! I know it’s only 3 days without junk, but the first few days/couple weeks are always the hardest, wouldn’t you agree? Resisting the initial urges and cravings and all that built back up while my eating was out of control. But, I’m feeling pretty good so far and my cravings have pretty much gone away. I’m going to do this for a few weeks and see how it goes. 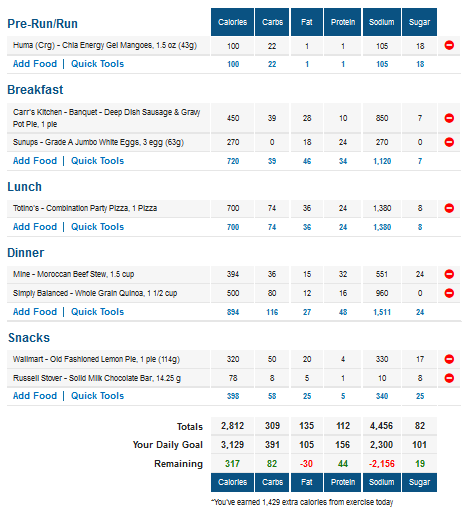 I’m hoping that it will help keep me more accountable and will then translate into some more weight loss for me. Where do you get steam in bag quinoa? That would be awesome!